Newark Academy is a place where students connect and collaborate, where today’s mentors inspire tomorrow’s leaders, and where students, parents and faculty form relationships that build community and shape the future. NA’s curriculum offers students uniquely designed academic courses and opportunities that prepare them for productive engagement in a deeply interconnected world. At NA, young artists master skills for academic success, critical thought and creative expression. It’s a place where the arts matter: where individuality and collaboration, tradition and innovation are valued. Through the decades, Minuteman teams have enjoyed success at every level, and NA student-athletes have achieved remarkable distinctions. Philanthropic gifts infuse every aspect of Newark Academy with the ability to strive for and deliver excellence. 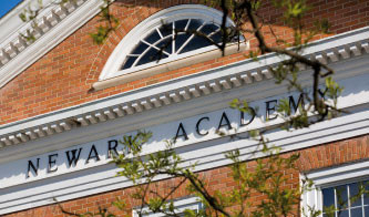 Founded in 1774, Newark Academy is older than the United States but its outlook is decidedly 21st century. Newark Academy's Summer Program combines a wide range of academic and enrichment course offerings with specialized workshops and an array of dedicated sports camps. The enthusiasm, pride and loyalty of Newark Academy alumni are central to the school's success and longevity. The alumni community is vibrant, participating in everything from the Alumni Board of Governors to nationwide alumni events throughout the year to the mentoring of current students and young alumni. And now, for the finale! The Campaign turns the spotlight on NA's Auditorium. What Matters About a School? Let’s get to the heart of it. Check out our interactive admission viewbook for families considering Newark Academy.